Gorakhpur: As the Chief Minister of Uttar Pradesh, Yogi Adityanath is busy at meetings in Delhi and Lucknow. But at the durbar that the Mahant, or head priest, runs out of a complex behind Gorakhpur's most famous temple, the only sign of his absence is the missing cane chair and his small table. Inside, his associates are still hard at work. The ones who type the letters that they promise can help fix almost any problem. From fast-tracking a pension request to getting the police to act against a land-grabber or sometimes, getting the police probe back on track. 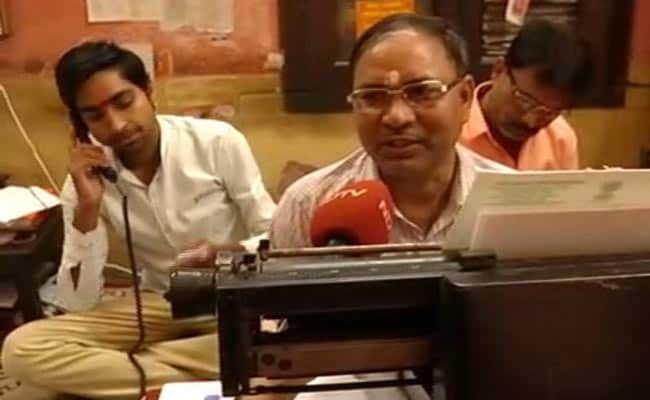 "Every day, the letters are typed in thousands," says Birendra Singh, Yogi Adityanath's man for the job, figuratively. With one hand holding the phone and the other on the typewriter, Mr Singh only stops in between to hear the men and women standing around him, waiting for their turn. One of them is Lakhan, standing by the door with the support of his stick. He too wants a letter, the one that will get him the wheelchair he needs. "I have come to the durbar earlier. The problems do get solved," Lakhan says. The durbar is an "assurance that people will get justice and their problems solved," an official said. On the other side of the room is Prabhavti Devi. Her son was recently beaten up by a few men. She alleges the police refused to file a complaint and wants a letter that will get the accused punished. The durbar was started by Yogi Adityanath's mentor Yogi Avaidyanath in 1980. But the Math's officials say its popularity shot up after the young, fiery leader took charge. "It was this assurance that people will get justice and their problems will get solved that brings them here in large numbers... They have faith in the Yogi's durbar," said Dr Pradeep Rao, one of the oldest officials of the Math. He insists that the letters that go from the durbar are hardly ignored. When they are, someone makes the phone call to seek compliance. If this doesn't have the desired effect, the next call goes from the Yogi Adityanath directly. It has been just a few days since the surprise accession in Lucknow but Mr Singh insists it was already reflecting in the people knocking at the doors of Gorakhpur Math. "Now people from all districts are approaching us," says Mr Singh, adding that people had started trickling in from as far away as Agra in western UP, over 400 km away. The politician-priest thinks a big dose of technology would help them keep pace with the spike in requests. "Maharajji (as the staffers refer to Mr Adityanath) has said that as soon as he returns, he will install computers in the durbar as well," says Divya Kumar Singh, a hint that this durbar - that has played a key role in seeing that its head priest hasn't lost an election since 1998 - is not going anywhere.